Last month, I reviewed the September Bestowed box and really enjoyed it. If you don't remember, Bestowed is a monthly subscription service where you can subscribe to receive a box of healthy snacks each month. It is only $15 per month which is cheaper than many other monthly subscription services. Since I am such a huge fan of trying new-to-me healthy snacks, I decided to try another month of the products. 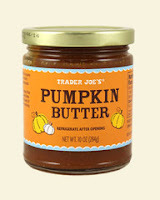 Trader Joe's Pumpkin Butter: I have been wanting to try this one for awhile now. It is rich and creamy tasting and is similar to pumpkin pie filling. It has 40 calories per tablespoon. My favorite way to eat this is mixed into plain Greek yogurt. It makes a sweet treat that is healthy and not too many calories. Amy's Kitchen Free Product Coupon: I have not redeemed this yet but am a fan of Amy's enchiladas and pizza. Fruit Bliss Dried Apricots: If you remember my reviews of dried fruit in the past, you remember that I absolutely love dried fruit. I do not eat it in place of fresh fruit as it is much higher in calories per serving but enjoy eating it in place of candy. It is a natural way to get some sweetness. These are much softer than most apricots and taste great with a stick of low-fat string cheese. Enjoy Life Seed and Fruit Mix: I love this mix sprinkled on top of fat-free frozen Greek yogurt for some crunch. As you can see, Bestowed sends a variety of types of snacks so that you can try some sweet, some salty, crunchy, etc. If you are interested in trying all different types of healthy snacks, you should definitely check out Bestowed. The giveaway will be for a one month supply of Bestowed snacks! hummas and pita bread, or chips or anything with cheese. Dark chocolate peanut butter cups!! YUM! I love fresh fruit like persimmons! I love blackberries, peaches, and grapes. I love pears! Also cherry tomatoes when in season. I do most of my shopping at Trader Joe's and right now love mixing their chopped vegetables with the light Cilantro dressing. I also always have bananas and kiwis for post workout and late night snacks! I love strawberries, in any kind of way! My favorite fruit snacks are Apples, Honeydew Melon, and Grapes and my favorite veggie snacks are Cucumbers, Brussel Sprouts, and Tomato. Pumpkin butter!! If this exists the possibility for butternut squash is around the corner. I would like to try the pumpkin butter..pumpkin anything is fine by me. i need to get me some bestowed! I like to eat carrots with dill dip! My favorite fruit snack is Plums. Celery with blue cheese dressing.